Thallus: crustose, composed of scattered to crowded granules, often ±evenly dispersed on the substrate, sometimes aggregated into thicker crusts granules: mostly round, 0.04-0.08 mm wide, sometimes becoming elongated surface: green yellow to yellow, smooth Apothecia: lacking to abundant, lecanorine, 0.3-0.7 mm wide margin: initially entire, later becoming granular and sometimes excluded exciple: often visible from the outside as a raised margin disc: darker yellow than the thallus, flat, becoming convex in old apothecia epihymenium: yellow-brown hymenium: hyaline, 55-70 µm tall; paraphyses: simple, ±cylindrical or somewhat swollen apically, tips to 3 µm wide; hypothecium: hyaline asci: clavate, 16-24-spored ascospores: hyaline, simple to 1-septate, ovoid to oblong, 7.5-11 x 3.5-4.5 µm Pycnidia: common, appear as darker yellow granules conidia: hyaline, ellipsoid to oblong, 2.5-3.5 x 1.5 µm Spot tests: K+ reddish, KC-, C- Secondary metabolites: calycin, pulvinic acid, pulvinic dilactone and vulpinic acid. Substrate and ecology: on the bark of broad-leaved trees and shrubs, sometimes on conifers and wood World distribution: world-wide Sonoran distribution: in coastal areas of southern California and Baja California including the Channel Islands and in open montane forests in Arizona up to the timberline. 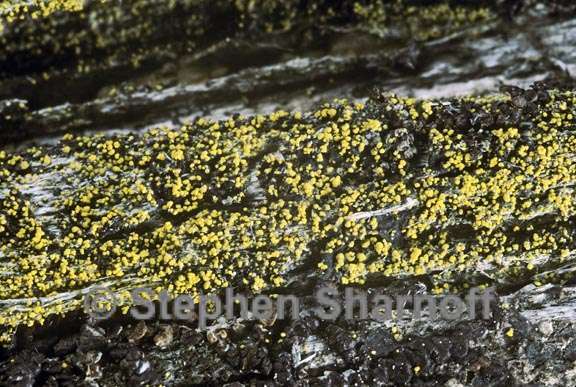 Notes: Candelariella xanthostigma is characterized by a thallus that is +entirely composed of small round granules. The likewise polysporous C. lutella has a thallus of small ±flat areoles and C. vitellina has a thallus convex areoles becoming minutely lobate.